Behind the beauty and drama created by the glass facade of the Edison Plaza office building, lay a host of challenges for Jessica Sims, a property manager with Hallwood Management Company. 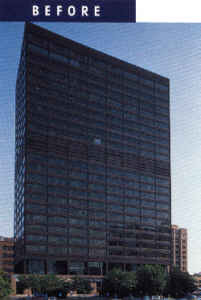 In December of 1993, she was faced with a list of tenant complaints that appeared to be related to the building’s glass structure. “During the summer, we’d have to start our two 820 ton chillers at four in the morning to have the building cool enough by nine,” said Sims, “and then we’d have to run at capacity for most of the day. But the fact that one side of the building would be freezing while the other hot, told us that the sun was preventing us from maintaining a consistent temperature throughout the building, and that the factory tint in the glass was not sufficient to do the job.” Sims also mentioned an additional aesthetic problem created by some tenants drawing blinds to cut the heat or for privacy which created an unappealing checkerboard effect from the street. Edison Plaza expects to reduce its annual energy use by at least 5%, partly due to a 70% reduction in heat gain and a lowering in its chiller capacity from 100% to 80%. Consistency in climate control has been achieved. With the reduced energy usage and a $24,000 energy rebate, the entire installation will be paid back in less than three years! In order to scientifically and precisely verify the energy-saving properties of energy-control window film, CP Films Energy Solutions Division joined forces with a leading national Energy Service Company (ESCO) to mount a clearly defined and controlled research trial. The location and duration (twelve months) of the trial were deliberately chosen to demonstrate energy savings in both cooling and heating seasons in a cool climate. This trial also clearly demonstrated that energy-control window films are not a “warm climate only” product. 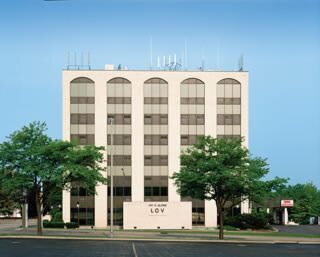 In early 2002, Llumar E-1220 Low-E solar control and insulating film was installed on an eight-story commercial office building near Chicago (Rockford, Illinois). 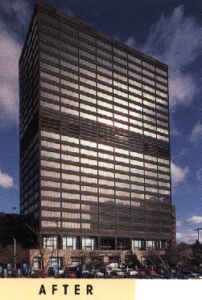 The building has a conditioned space of 59,000 square feet and windows are single-pane bronze tinted glass. Heating and cooling is provided through all-electric room unit ventilators. Prior to film installation, CP Films created a computer-driven model which simulated energy savings, using the U.S. Department of Energy analysis method (DOE-2) to serve as a benchmark. The independent ESCO test made use of a methodology fashioned by IPMVP Inc. (International Performance Measurement and Verification Protocol), a worldwide non-profit organization which develops products and services to aid in the measurement and verification of energy savings from energy efficiency projects. During the twelve months following film installation, IPMVP measured energy savings of 8.8% were noted, yielding a 3 year payback. This compared favorably with the simulate DOE-2 analysis which had shown 8.4% energy savings and a return of the initial investment within three years. The analytical experiment unquestionably demonstrated that substantial energy savings can be obtained through the installation of energy-control window film with the reasonable expectation that initial installation investment can be cost-effectively retrieved. Moreover, energy savings can be accurately predicted using DOE-2 computer simulation methods.